My Watermark is Grenadier Pond in High Park Toronto, Ontario. I spent a lot of time playing and cycling in High Park as a youngster. 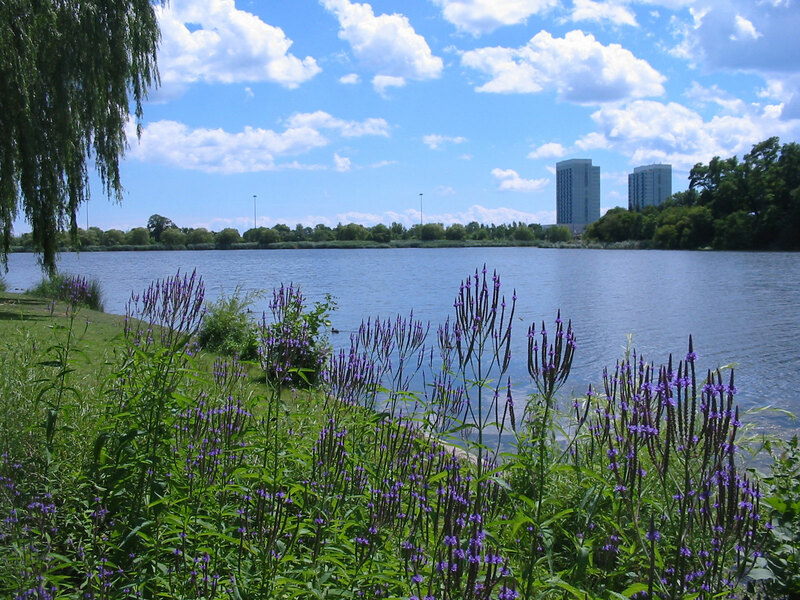 The park was and remains a fascinating oasis due to its location, its varied topography, the zoo, its winding roads, trails—and Grenadier Pond. Until 1988, the City operated a seasonal boat rental facility there: it was built in the same "log house" style as one of the old concession stands that still exists on Colborne Lodge Drive, across from the baseball diamond. Every summer, one could rent paddleboats, row boats and even a small Sunfish sailboat. To a kid, Grenadier Pond looked more like a small lake than a pond, and its open vistas provided plenty of room for paddling. On some days, a brisk northerly wind blowing along the length of the Pond would even stir up whitecaps that would hit the southern shoreline. But the waves never got so high as to make paddling unsafe. I remember thinking, countless times, that Grenadier Pond was truly the jewel of High Park. But even then, something was amiss: although we could boat on the pond in summer and skate on it in winter, nobody swam in the Pond. There were green signs on metal posts in certain places that simply read: "Swimming Prohibited." I used to think, "What a great little lake... Imagine if the water were clean and if there were a small beach—it'd be perfect." But unlike the many small lakes administered by conservation authorities just outside the city, Grenadier Pond was never managed for swimming. With its watershed being completely urbanized and fed by stormwater, the Pond was stressed: eutrophication caused huge summer algal blooms, made worse by the unfortunate habit that many people had of feeding bread to the local waterfowl. Resulting E.coli counts would explain the lack of swimming. (Although I did once see a man jump into the pond to retrieve a stray frisbee! He swam back out without incident). As the 1980s drew to an end, so did boating on the Pond. The City took down the old boat house, which was becoming structurally unsound. I assumed that a new one would go up, but that never happened. There was no explanation for the loss of boat rentals. As the years went on, it became obvious that the very activity itself had been discontinued and even disallowed. Consider the situation nowadays. The Pond has been partly naturalized (all along its southern shoreline), greatly reducing public access to that portion of it. Until recently, the City has discouraged winter ice skating, but within the last couple of years, it seems that better risk management will once again make this a safe and enjoyable activity for park visitors, conditions permitting. I can't help but think that the Pond has unrealized potential as a place where park users could connect with the resource as they once did: by canoeing, paddle boating and kayaking. In recent years, the topics of liability, people trespassing onto private properties along the western shore, and protection of flora and fauna occasionally come up as reasons for banning human recreation on the Pond. The flora and fauna need protection, but humans are not outside the natural environment: we are part of it too! People need to be able to interact with a waterway if they are going to care about preserving it and improving its cleanliness. For every challenge, there exist two options: ban activities (out of sight, out of mind); or work towards intelligent, manageable solutions that get people involved. Finally, non-motorized boating has a long history on the Pond, going back at least a century, if not earlier. For this reason, I share these reflections about Grenadier Pond—with the hope that one day soon, it will again be possible to spend a leisurely summer afternoon paddling its shimmering waters and appreciating what a treasure it really is.